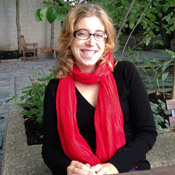 Home » Sarah Allred, Ph.D.
and Behavior from the University of Washington. She also holds a BS in Applied Physics with minors in mathematics and philosophy from Brigham Young University in Utah. For her primary research on the relationship between visual perception and memory, Dr. Allred received the National Science Foundation’s CAREER Award. Dr. Allred teaches courses on research methods, experimental psychology, and perception and evolutionary psychology; she is a past recipient of both the Chancellor’s Award for Teaching Excellence and the Presidential Teaching Award. As Faculty Director of the Walter Rand Institute, Dr. Allred marshals the academic and intellectual resources of the university to help fulfill Rutgers’ foundational obligation to civic and community engagement. To do this, she fosters partnerships between academic researchers, WRI staff, and community stakeholders. Dr. Allred enjoys delving into complex data sets and working with staff to extract from the data content that will be meaningful for South Jersey. Page last updated by Senator Walter Rand Institute for Public Affairs at 2:59 pm October 5, 2018 . This page was printed from http://rand.camden.rutgers.edu/sarah-allred-ph-d/ at 8:19 PM Saturday, April 20, 2019.